National has built a reputation for developing new and innovative label solutions. We also know how important it is to share new ideas with our customers. We want to share some of the unique solutions we have developed over the years and, hopefully, stimulate you to collaborate with us designing your next solution. National was awarded a printing industry PEAK Award in both 2015 and 2016 for innovative solutions. If you need samples of any of the products below, please contact us. Retailers want to have the flexibility to change prices and offer promotions on a weekly, or daily basis. 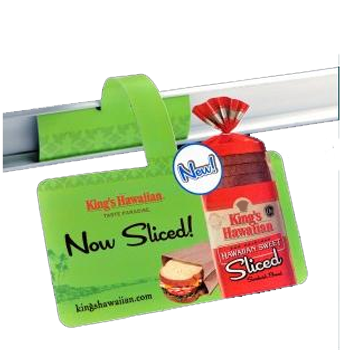 The ability to generate shelf pricing labels and/or shelf promotional signage at the store level enables retailers to respond quickly to shifts in demographics, seasonal holidays, and promotions from vendors, etc. Most often these changes are made on a laser printer (although Thermal technology is slowly making its way in). The problem has been laser imaging on film or tag material. The toner sits on top of the film substrate and when applied to the shelf molding tends to crack and flake off. This results in critical information for the consumer and inventory control to be missing. Additionally, shelf moldings are periodically cleaned using strong cleaning solutions that wipe most top coatings off along with the toner. National has developed a laser topcoat to meet the demands of this application. Laser toner ‘bakes’ into the top coating and holds up to concave moldings, cold refrigeration and freezer temperatures without flaking or curling. It is also detergent resistant. This ability to change prices and institute new promotions ‘on-demand’ enables Retailers to increase sales and profitability at each store. Cross contamination of medical equipment stored near each other. 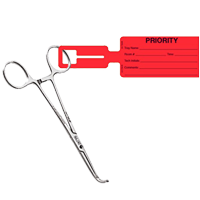 One unique custom label application involved the cleaning and sterilization of surgical instruments. This critical process requires extreme measures and clear procedures to insure there is no cross contamination between patients. This process requires that used or broken instruments are clearly isolated and marked, and that those instruments in the sterilization process are not contaminated by exposure to ‘dirty’ ones. There is a need for instruments to be clearly marked and easily identified. National developed color-coded tags which can be applied to the instruments and follow them through the sterilization process. This required the tags and inks to withstand high temperatures without ‘running’ or curling. Using specialized inks with unique additives we designed a solution to meet this customers specifications. The hospital has mitigated the financial and health risk of cross contaminating their medical equipment with a low cost labeling solution. Having successfully implemented this solution for one hospital using National’s custom label solution our customer is now able to leverage this success by offering the same solution to other hospitals and medical practices. 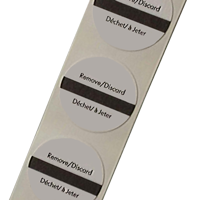 There are numerous applications within the Healthcare Industry for labels and tags. Many of these applications are driven by software. Scratching of glass between glass production and delivery to customer resulting in high product rejection rates. A large manufacture of glass panes was having a problem with scratching resulting in a large rate of rejection from their customers. Panes of glass were stacked after production and transported to assembly plants for use in various appliance products. Unfortunately, these stacked panes of glass would rub together in transit damaging them. When the panes were received, inspection rejected any glass with scratches. The manufacturing company needed a way to separate the panes from each other to avoid direct contact. In addition they wanted to be able to apply the spacers automatically in the production line, and be removed easily and cleanly when the panes reached the assembly plants. Our solution was a unique two-ply material developed using our in-line adhesive coating capability. We laminated a paper material on top of a static cling vinyl material. The paper enables printability and added thickness for proper spacing between panes to prevent scratching during transit.